THET SU LIN is willing to work as a maid and able to do household chores, including taking care of elderly as well as willing to learn cooking. She is willing to taking care of elderly like showering, feeding, exercise and so on. Whether you need a maid for your newborn baby, young children, elderly folks, sick or disabled family member, or you need a good cook, we are sure that we can give you reliable and responsible maids with our good service and stringent selection process. Take the time to do things that make you and your loved ones happy. Pamper yourself a little – you deserve it. Leave the housework to the domestic helpers and focus on other important things.! New/Ex Full time Maids Myanmar Maids available. Full time Maids Filipino Maids available too! Frondosa City Employment Agency is a licensed maid agency. 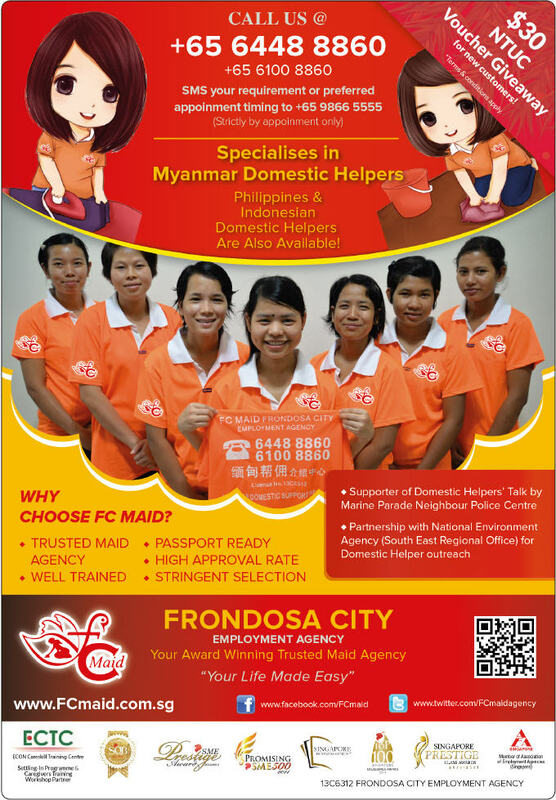 With extensive experience in the maids agency, we have selectively associated with well established and reputed overseas companies in Myanmar to recruit foreign domestic helpers. Our team of consultants are well-trained and experienced to identify and access maids to match our clients’ specific requirements and needs. We are dedicated in delivering the best possible excellent service to you, our clients. And our commitment to go through the process of selecting a domestic help smoothly.We assure you that all domestic helpers go through a carefully selected process through our personal interviews with the candidates concerned. Our domestic helpers are screened and trained in our Training Centers in preparation of their impending deployment to Singapore. Our training centers ensure the highest standard of training by having a complete range of training program & facilities to match the needs of Singaporean families. At FC MAID, our consultants provide you with Best MAIDS Myanmar Maids Burmese Maids Burma Maids Filipino Maids. We believe service standards that are transparent to you, our valued customer. In respect of service transparency, we - Adopt ethical sales practices and marketing communication. - Ensure that our pricing policy and all service charges are crystal clear to you. - Indicate the payment methods available to you i.e. cash or cheque payment only. - Provide a signed copy of the Service Agreement for your reference and retention. - Seek and value your feedback anytime. If your feedback is less than positive, we endeavour to resolve the problem either IMMEDIATELY or within 20 working days, depending on case by case basis duration might be extended. If you are not happy, we are not happy. We provide a service guarantee for UNLIMITED FREE replacement (Excludes Insurance, SIP Package & Thumbprint) of your Foreign Domestic Worker Maids within 12 months from Maids commencement of employment (Minimum employment period of 1 month applies) with you. If you need to transfer your Foreign Domestic Worker Maids to another employer, we can also assist you. The terms and conditions of such transfers shall be clearly explained to you. We provide a fair and comprehensive Service Agreement to you which amongst other things state the terms and conditions of service transactions including any deposits paid and also the date of commencement of the Foreign Domestic Worker's employment. We are committed to safeguarding the confidentiality of you, our valued customer's data. FC Maid have Filipino Maids too. Filipino Maids have their own strength and weaknesses. We currently do not do Indonesian Maids as there are alot of negative news about Indonesian maids which includes Indonesian Maids child abuse, physical abuse of elderly and many more.